The letter below can be used to communicate with people or organizations that have not deposited checks. Copy and paste the text into your letter, and review with your attorney to determine if it will meet local laws and due diligence requirements. Update the information between brackets (“[“ and “]”) to fit your needs. Note that our policy is to void outstanding checks after 90 days. In addition, state law may require that we turn these funds over to the State of [State Name] as unclaimed property if we do not receive your response by [Deadline]. If you have the check, please deposit it immediately. If the check has been lost or destroyed and you need a replacement, please verify the information below and return this letter to us as soon as possible. Please call us at [Phone Number] with any questions. Unfortunately, you do not get to keep funds when checks go uncashed. If the recipient was entitled to those funds, they (or their heirs) are still entitled to the money. When funds go unclaimed, they often must be turned over to the state for safekeeping (known as escheatment) until they are claimed. If you operate a business, be sure to check with state and industry regulators to verify the requirements that apply to your check. You may have to include certain language or follow other rules related to unclaimed property. Payroll checks might be different from checks to vendors. You don’t have to use the exact format above. Some organizations prefer to use a separate form where the recipient can request re-issuance of a stale dated check. In addition, you might want to include the option for the recipient to request that you don’t re-issue the check, as they may have a legitimate reason for not depositing the check. 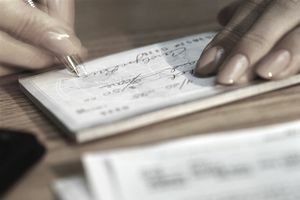 To learn more about uncashed checks in general and why they're important, see Basics of Outstanding Checks. The best way to find out about these items is to keep good books: reconcile your bank accounts regularly, and follow up on payments that have gone uncashed for too long. If you simply hold the money (intentionally or not), you can open the door to more problems and increased scrutiny from regulators.